The device, developed by engineers at Penn State in collaboration with researchers at the National Heart, Lung, and Blood Institute (NHLBI), part of the National Institutes of Health, and the Washington University School of Medicine, will benefit patients in the U.S., where 12 percent of the population, or around 19 million people, have asthma, and in undeveloped regions where TB is still a widespread and often deadly contagion. 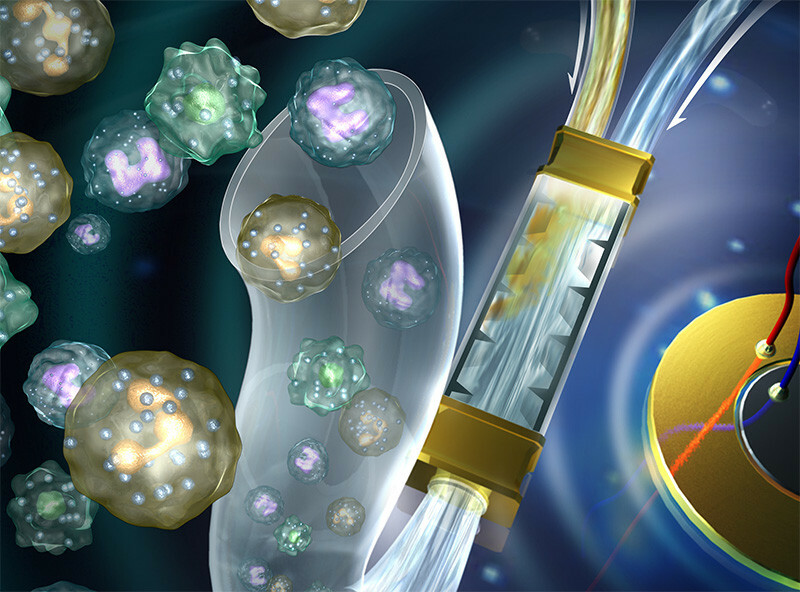 “To develop more accurate diagnosis and treatment approaches for patients with pulmonary diseases, we have to analyze sample cells directly from the lungs rather than by drawing blood,” said Tony Jun Huang, professor of engineering science and mechanics at Penn State and the inventor, with his group, of this and other acoustofluidic devices based on ultrasonic waves. There are several problems with the current method for sputum analysis. The first is that human specimens can be contagious, and sputum analysis requires handling of specimens in several discrete machines. With a lab-on-a-chip device, all biospecimens are safely contained in a single disposable component. Another issue is the sample size required for analysis, which is often larger than a person can easily produce. The acoustofluidic sputum liquefier created by Huang’s group requires 100 times less sample while still providing accuracy equivalent to the standard system. A further issue is that current systems are difficult to use and require trained operators. With the lab-on-a-chip system, a nurse can operate the device with a touch of a few buttons and get a read-out, or the patient could even operate the device at home. In addition, the disposable portion of the device should cost less than a dollar to manufacture.